What have you taken with you for the journey? ... the journey that you are now on: the one taking you, whether you will it or not, to the end of all things, and beyond ... to God, to what has been prepared for you from before all time? It is too much ... whatever it is. What is between the soles of your feet and the earth ... that alone you may take with you, and in the end, even that you must leave behind. Whether victims of the Great Depression of the 1930s or the Great Recessions of 1980 or 2008, our parents had unwittingly infected us with their painfully acquired insecurity: having learned how quickly all that they possessed can be lost more quickly still, they had erected barns in their abundance against the time of famine, of need. For many of them, the silos of grain could not be emptied in a lifetime, but still they were left ... against the time of need ... to dry unto dust, closed from the light, hidden from the world, lest the world see it in its need ... and beg for it. ... and they died, so many of them — in great abundance but in far greater poverty. We took the stock and store, and learned their lessons well, keeping for ourselves what we do not need even in the gaunt face of the pressing need of others – against the time of our own need, against the time of our own want. We have marked out our journey and carefully laid store our grain ... that we do not come to have nothing. And if we have not spent it, as our parents had not spent it, we keep it for our children to keep it for their children — and the grain rots and becomes a testimony to our selfishness, declaring in its putrescence that we are fools. Yes, we know our way in the world — which is the way of the world, and has ever been the way of the world. For this reason, for our inexpungable selfishness, Jesus well knew that, “the poor you will always have with you.” Our silos are bloated ... almost as much as the the stomachs of the starving children in Sub-Sahara Africa. They die by the day in the thousands — for want of a teaspoon of grain. They die in their childhood with nothing and go to God. We die in our old age, filled with years, stock portfolios, great silos, and in peril of Hell. We will go well-provisioned with perfunctory acts of piety, having fulfilled the letter of the law while purblind to the meaning of the law. We take our stock and store of spiritual silos and think that they will be acceptable to God — who told us to take nothing for the journey ... knowing full well that we have relied on our clever resourcefulness, our self-redemptive piety ... and not His mercy. These spiritual silos — no less than those filled with our grain — will testify against us that we have not known our brother, have turned a deaf ear to the cry of our sister, been heedless of Jacob. 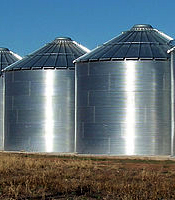 For from the abundance of our spiritual silos, we should have emptied those material silos overflowing with grain — and then dismantled both — as Jesus tells us today — to take nothing for the journey. This is the journey, the path, that leads to God, in obedience to God. It is nothing less than utter trust in God that Jesus calls us to — both materially and spiritually — and the one will ineluctably reflect the other. In the end, at your last breath, the rush of truth will come upon you, and all that you have kept for yourself — and from Him ... in Himself and the least of His Little Ones ... will witness against you, in itself, and in the little ones from whom you kept what God had entrusted you to give them – as Joseph gave to Jacob and his sons – his brothers. I ask you again: what will you take for the journey ... and what morsels will you leave behind for those who worked your fields but did not eat your grain...? You do not see that you stand to lose nothing ... only your own insecurity and selfishness.